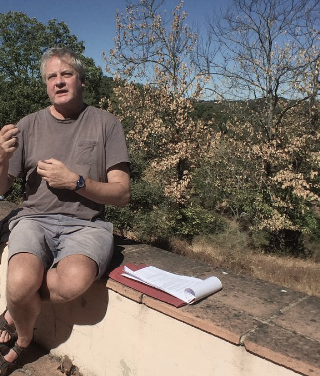 Stuart Delves and Samm Short remember how last year’s advanced course was a little bit different – blending writing and yoga in the house overlooking the sierra. Samm, you began your Dark Angels journey on a Starter Day in Strawberry Hill. How did you find that day? Darkly fun. I hadn’t really appreciated how important a sense of place is to DA, and was thrilled to find myself somewhere as odd as Strawberry Hill House. I also wasn’t prepared for how kooky some of the writing activities were, and was happily taken by surprise by what we were asked to do, and in such wicked time restraints. I wrote, and when I got home I re-wrote, and the simple pleasure of being with language again was beautiful. I think perhaps because I was teaching – for want of a better word – around that time, I’d forgotten what it was like to just write without a goal. I’d allowed a gap to forge between what I was prompting others to do, and what I was doing myself. So to write for the pure fun of it, with no product or plan in sight was like rediscovering a childhood wonder. Of course the beauty of that kind of writing is that is nearly always triggers something ‘useful’ (I re-read my website with a mixture of horror and fascination that night), – but I was much more thrilled by the fact I’d written a poem, and a spooky one at that. Your writing had impressed the tutors, John and Elen, and Neil also knew your work, plus the fact that you also taught yoga. So we hatched a plan. Or rather they suggested I hatch a plan. They thought you were up to going straight on to the Advanced Course in Spain. And what about adding in a bit of yoga on the fringes of the day? Well that’s what we did. Before asking you how you thought the yoga fitted in, tell me how you found Spain and Finca El Tornero – a very specially selected Dark Angels place. The Finca was magical. 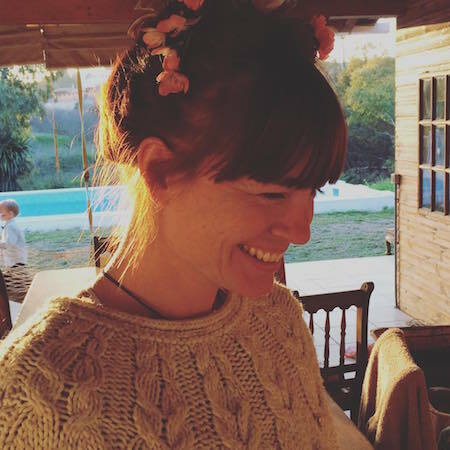 In the evenings we sat around the fire drinking wine and listening to jazz, and it was straight out of a Woody Allen screenplay – ‘A group of ambitious writers met at an old Finca in the hills of Seville…’; it felt like anything could happen. In the mornings we’d wake up and wander into the kitchen with the smell of fresh coffee – thank you Richard! – and then out into the sunny courtyard with pen, paper and a whole heap of curiosity. I’d been working as a freelance copywriter and writing tutor for two years at that point, and was used to being stuck at my desk, writing hard to meet deadlines and bring in work. I rarely found time to reflect on what I was writing and whether there were ways of making it more effective, and more enjoyable to do. Being at the finca provided much needed breathing space, and a boost to my motivation. It was also a particularly poignant introduction to Spain; after the course I drove down to meet my parents at our new home just outside Malaga. It was our last viewing before moving out there a month later, to set up a retreat centre for yoga, art and writing. I hope that is going well and I’m sure you weave together the three disciplines seamlessly. How did you find the yoga practice combined with the Dark Angels course? You certainly had a few enthusiasts joining the morning sessions! It was such a beautiful way to start the day. For me yoga is a way of moving away from the self-limiting, overly-rational mind, and submerging into something deeper and more instinctual. I find it helps me to get out of my own way, and be more intuitive and present with whatever life throws at me – and as a freelance copywriter that’s essential! When I write – whether for a client’s funding bid or a personal poem – my internal censor can kick in almost instantly, strangling the words before they have a chance to be born. Doing a physical and focussing practice beforehand can set the mind-body-heart system up so that censor has less of a grip, and we can perhaps be a little braver in our writing. We’re surrounded by words – and sometimes we need to shake things up a bit to find new ways of communicating with them. In the morning sessions we started with a quote by the 13th century Persian poet Rumi – his words never cease to amaze me on a poetic but also on a spiritual level. And we tried an afternoon walking meditation too– one fellow writer found the missing last line to his chapter in that session, which was a great example of how these practices can complement each other. But I’m obviously biased! How was it from your point of view? I thought it was a really nice addition and contributed to the reflective atmosphere of Finca El Tornero. Because we choose secluded retreat settings for our courses there is always a hint of the monastic, where physical exercises were traditionally used to aid contemplation, yoga and tai chi in the East and the perambulation of cloisters in the West. The relationship between movement and writing has often been a fascinating topic of discussion that arises within Dark Angels. A lot of people who come on our courses from the corporate world are runners. And many are dedicated walkers. I particularly enjoyed the walking meditation, barefoot in the sun kissed grass. A tip I often give, particularly when running in-house workshops in corporate settings is “Get up from your desk. Go for a walk, around the square or park if you can, or to the water cooler at the vey least.” Movement shifts thought. Being glued to the keyboard eight hours a day is antithetical to creativity. Andalucia was a great place to bring in the yoga practice. One of the things that keeps me enthralled by Dark Angels is the openness to development. The year before last in Aracena we joined the annual pilgrimage out from the town into the countryside following an ox-drawn cart bearing a candle-lit effigy of the Virgin. It was a beautiful, affecting experience. Then last year, along with your yoga, Neil took a group to an outlying village along the old cobbled and shaded donkey tracks that criss-cross the Sierra. You’re right – anything can happen. Like a good Rioja, as Dark Angels matures, the mix gets richer. Thank you Samm for helping to make last year’s course so special.